By now, the sun should be shining, and with that, the advent of spring. Just kidding, you’re most likely getting hit with thunderstorms. What to do? 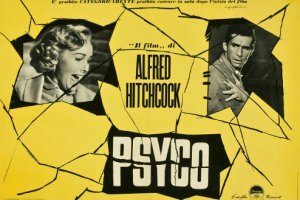 Check in, relax, take a shower, and put on Alfred Hitchcock’s 1960 classic, Psycho. We haven’t given enough love to some of the classics, and that’s about to change. Here are five reasons to watch this granddaddy of horror this weekend. Somewhere, someone is whispering, “Erin, you sick freak,” and, well, they’d be right. 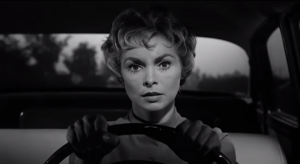 Psycho is the story of Marion Crane (Janet Leigh), a woman on the run who encounters shy motel owner Norman Bates (Anthony Perkins) and his mother, with whom he has an abusive, colorful relationship. I’m trying to be nice to the people who haven’t see it. We’ll leave it at that. The film is based off of Robert Bloch’s novel of the same name, and Hitchcock did something pretty sly with it: he bought up every copy he could once he procured the rights to make the film. He didn’t want spoilers leaking, and pre-internet age, he did a damn good job. Audiences were left reeling as the film hurled more twists at them. It was tough to read the book and know what was coming. I have to admit, for a dude who obsessed over details – like getting creepily invested in his actresses, which is a topic for another day – the quality served the initial impact well. Many filmmakers would kill for that type of gag order. Oh this must have gutted audiences. Herrmann’s score is iconic and one of the few that will consistently calm me when I’m upset. It’s perfect, and I rank it up there with Mansell’s work on Moon. Fun fact: Hitchcock paid Herrmann double the normal salary because he loved what Herrmann was doing; he was paid $32, 000, which was a large chunk of change back then. I agree – the film wouldn’t be the same without his contribution. While everyone else was doing films in color, this film had to be black and white. The reason: Hitchcock loved the French classic Diabolique, which was a black and white film. So while everyone else was doing happy technicolor films, Hitchcock was underpaying his actors, investing in music, and shooting in black and white. Looking at it now, the film is genius. That doesn’t stop the fact though that If someone did this now, I’d probably roll my eyes so hard they’d get stuck in a constant annoyed glance at the ceiling. Kind of like Aubrey Plaza. Anthony Perkins is this movie. He manages to go to places of darkness and pity that most actors would have trouble reaching. He was perfect as Norman, but the truth is that he was so much more than that. Use this film as a springboard to discover how good he was. Check out films like Goodbye Again, Catch-22, and Someone Behind the Door. He’s most famous for Psycho, but please use it to discover what a gem he was. You can rent Psycho on Amazon, YouTube and iTunes.